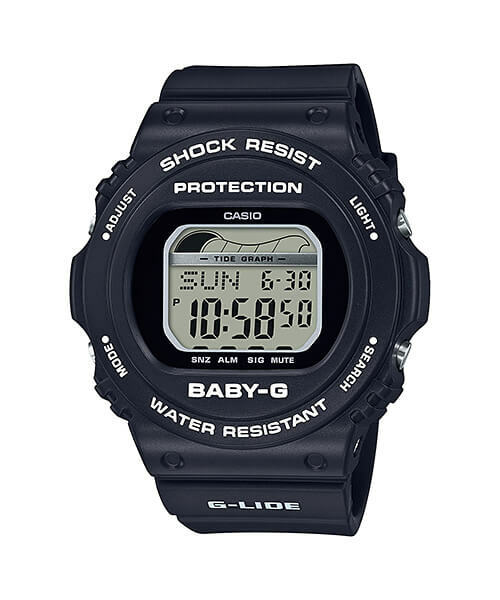 Like the square Baby-G BLX-560 which is modeled after the G-Shock 5600 case, the Baby-G BLX-570 is another G-LIDE surfing watch based on the recently revived G-Shock 5700 retro line featuring a round bezel. 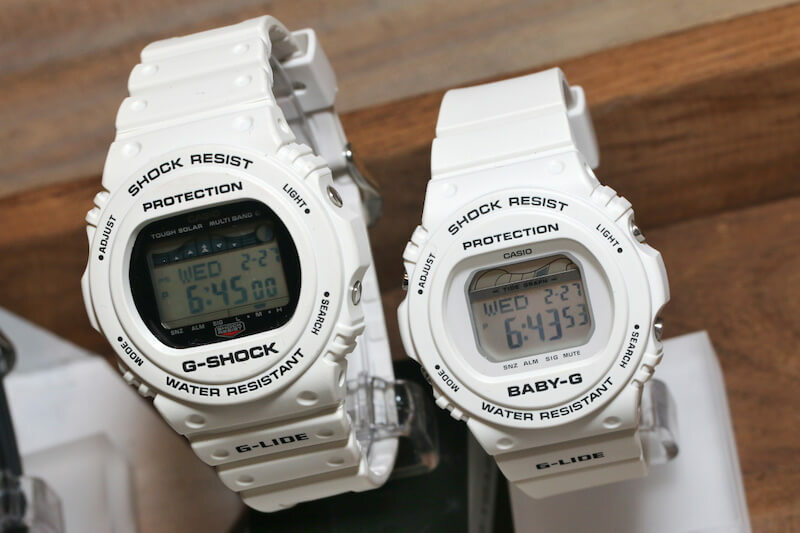 The first two models, the black BLX-570-1 and white BLX-570-7, match the black and white models from the G-Shock G-LIDE GWX-5700 series. 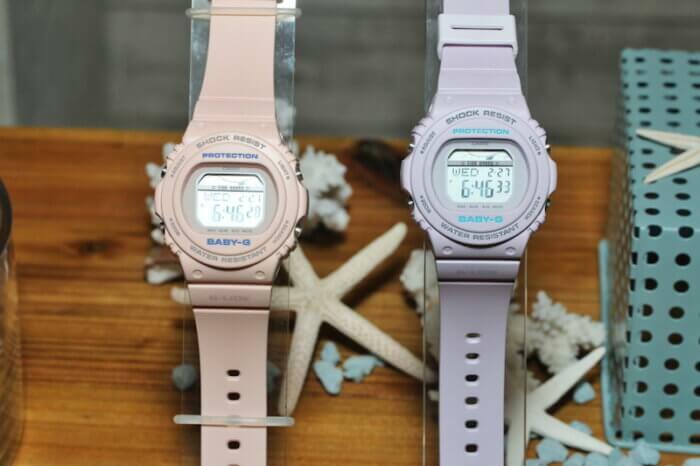 The second two models, the BLX-570-4 and BLX-570-6, feature a cream pink and a light purple pastel color, respectively. 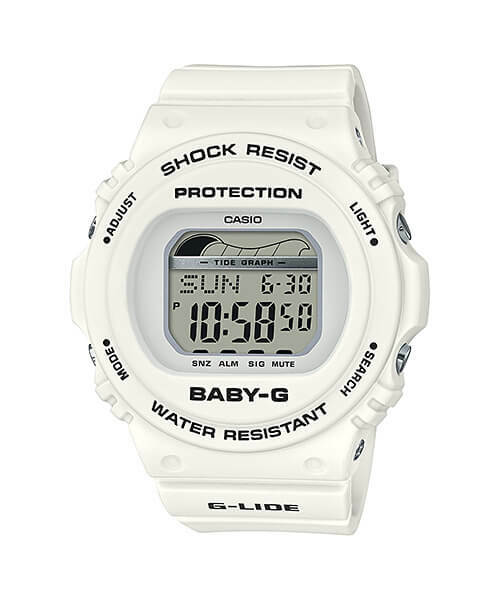 The BLX-570 has 200-meter water resistance, a tide graph, and numerical moon age data. Like the classic square case models, the BLX-570 has a relatively slim and compact profile with dimensions of 44.9 x 43.0 x 12.9 millimeters, making it an excellent choice for sports and water activities. 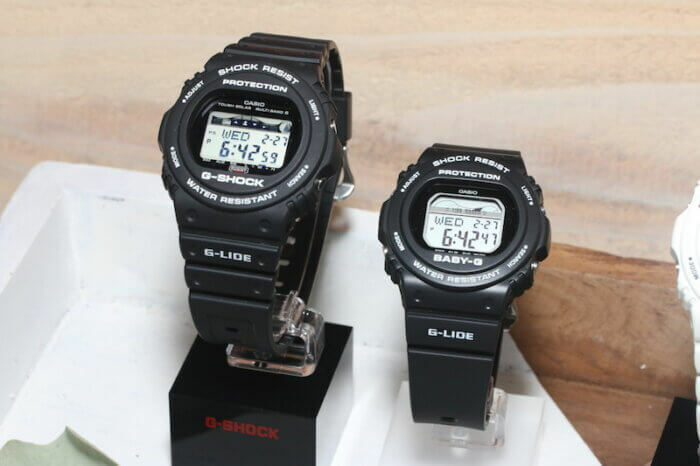 Other features include world time, 1/100 second stopwatch (24 hour max, 5 seconds countdown auto start, with split), countdown timer (24 hours max), 3 alarms with 1 snooze alarm, hourly time signal, alarm sound flash function, and EL backlight with afterglow. The BLX-570-1JF and BLX-570-7JF will launch in Japan in April 2019 and the BLX-570-4JF and BLX-570-6JF will launch in May 2019. Each has a list price of 9,500 JPY.